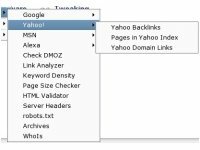 MYSEOBlog writes in their article about three seo firefox add ons. Here are a few counterparts that you can add to Firefox to benefit your SEO experiences. These plugins are great for SEO enthusiasts, and also for people/businesses that are just getting started with SEO. SEOpen – This add-on allows quick and easy access to web-based tools that will aid you in your SEO efforts, and it also provides instant page rank statistics and an inbound-link checker. SEO for Firefox – This great add-on acquires market research data that is useful for your business’ website, along with page rank statistics and age of the website. It also allows you to view whois data in an easy format. SEOToolbar – Requested parameters are shown in a separate toolbar in the browser. SEOBar – Requested parameters are shown in a separate, fully customized bar with a CSS, HTML block. SERPBar – Output of requested parameters on Search Engine Result Pages (SERPs). If you are unsure of how to install and use add-ons in Firefox, they have provided this quick-and-easy tutorial that will help you step-by-step in adding the add-ons above. Please feel free to leave any feedback in our comments section of how these add-ons have helped you in your SEO journey.